Hundreds of years in the future, after the Something that Happened, the world is an alarmingly different place. Life is lived according to The Rulebook and social hierarchy is determined by your perception of colour.Eddie Russett is an above average Red who dreams of moving up the ladder by marriage to Constance Oxblood. Until he is sent to the Outer Fringes where he meets Jane a lowly Grey with an uncontrollable temper and a desire to see him killed.For Eddie, it's love at first sight. But his infatuation will lead him to discover that all is not as it seems in a world where everything that looks black and white is really shades of grey . . .If George Orwell had tripped over a paint pot or Douglas Adams favoured colour swatches instead of towels . 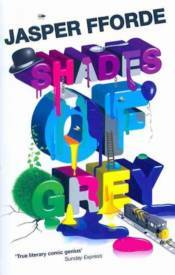 . . neither of them would have come up with anything as eccentrically brilliant as Shades of Grey.